As content marketers, it goes without saying that most of us spend the better part of our day on the web. We’re content enthusiasts. We’re always on the hunt for a campaign or idea that will wow us or (preferably) click “Share” on social. A recent survey by the Pew Research Center found that 44 percent of Facebook users like content posted by their friends at least once a day, and nearly a third do so several times per day. For marketers, this means that consumers value what their friends and like-minded individuals share. It also emphasizes why more brands are turning toward influencer outreach. Influencer marketing isn’t anything new. Before the digital revolution, celebrity endorsements were the go-to tactic for this marketing strategy (think any “Got Milk” ad from the late ’90s). But what has changed is the nature of influence, particularly because high-level reach doesn’t always equal conversions. The good news for marketers? New analysis shows you only need a handful of influencers to give the impression that everyone is talking about your brand. (highlight to tweet) Researchers at the University of Southern California recently uncovered the majority illusion, a phenomenon within social networks that explains why some ideas, behaviors, or attributes appear widespread, even when they are not. In short, posts from a few users that have a lower number of social connections won’t go very far because of the lack of connections. But if a few users with a very large number of connections share or post something, it is far more likely to spread. This may seem obvious. The counterintuitive part? The number of people with the large followings needed to create the effect is actually incredibly small. Let’s say that each red dot is a user who shares a spoiler from the latest episode of Game of Thrones (blasphemy, I know). The network structures in both figures are identical, yet the placement of users who share the spoiler differs. 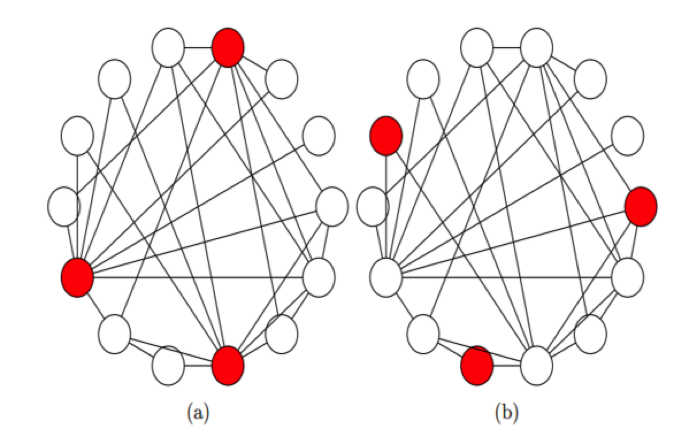 Figure A illustrates the majority illusion in action: A few well-connected people share the spoiler, causing a large fraction of the network to see the post. This can give the impression that a lot more people are learning about what happened in the episode than is actually true. Figure B demonstrates a “winter-free” social media feed; the Game of Thrones fans in this scenario are less well-connected, so members of that network are less likely to see the spoiler. Interesting, right? But how can you use this for your brand? A whopping 75 percent of marketers consider finding the right influencers the most challenging aspect of an influencer marketing strategy, so my team decided to eliminate some of the grunt work through an interactive visual. We created the influencer marketing network graph below using 77 midlevel Twitter influencers (between 30,000 and 500,000 followers) across eight different verticals—automotive, business, entertainment, finance, health, lifestyle, technology, and travel—to illustrate strategic positioning of influential accounts. Each dot is a Twitter user, and each line represents a relationship with another user. The larger the dot, the more connected that individual is within his or her network. We also highlighted the vertical each influencer belongs to through different colors. As you can see, the larger nodes often have connections across multiple verticals. Let’s say I work for a brand that just created a new dining app that bases restaurant popularity on how many photos are tagged at an establishment on Instagram. We’ll call it InstaDine. To get the word out quickly, I’d want to send info about the app to a handful of influencers who are highly connected. Using the interactive above, a great place to start would be @ZagatTravel because their influence spreads into more than five verticals. The visibility for InstaDine is greatest among these strategically positioned individuals with the larger dots because their diverse network will make it seem like everyone is talking about this new app, when in reality, only a select few shared a story about it. 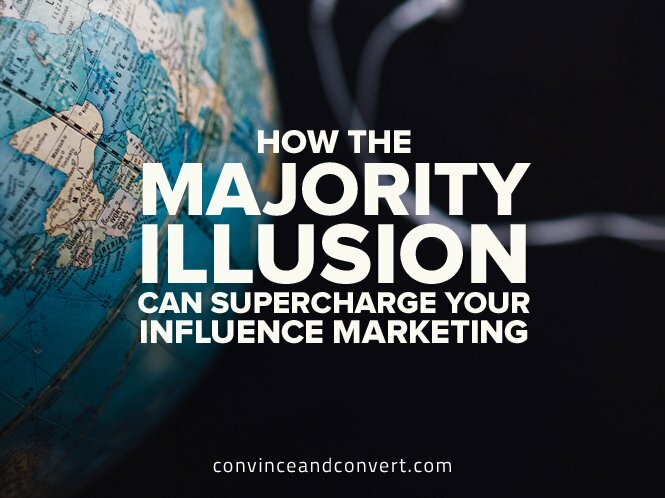 Keep in mind that influencer marketing focuses on earning a person’s attention, and the majority illusion helps you break through the noise by creating a sense of high demand and popularity. If you really want to boost shares, coordinate with a handful of influencers to push your content out around the same time. It will truly give the impression that “everyone” is talking about your brand. The biggest takeaway from our research? Don’t confuse reach with influence. Instead of looking for influencers with a large following, it is important to understand how influencers are connected to your audience. Review this deck to learn more about how you can use the majority illusion to boost your outreach efforts.